Looking out over the Old Port and marking the entrance to historic Mykonos Town is Manto Mavrogenous Square—the lively epicenter of the quintessential Greek Island destination. A popular starting point for walking tours, the square boasts handicraft shops, restaurants, and cafes along its seafront promenade, while its white-painted, blue-shuttered buildings make for a pretty photo opportunity against the ocean backdrop. At the heart of the square stands its namesake monument, an unassuming statue of Manto Mavrogenous, the Greek war heroine famous for her role in the Greek War of Independence. 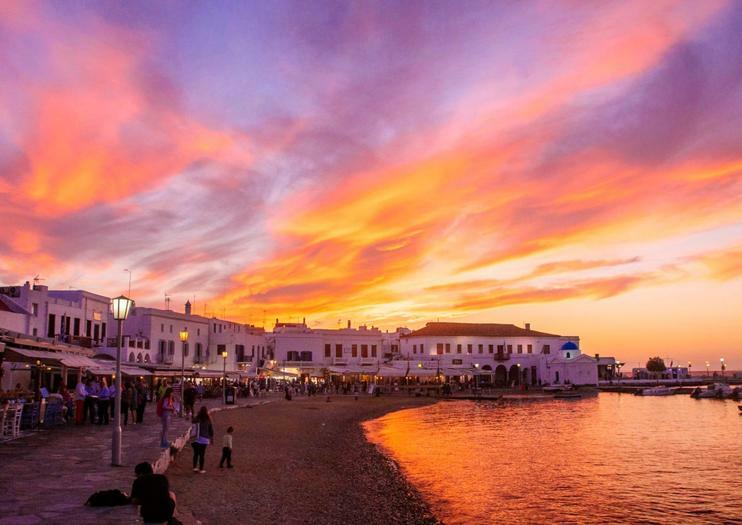 Manto Mavrogenous Square is located by the Old Port in Mykonos Town.